Taunted by low prices, getting the best bargains. You can get blinded with the great deals you can find online in one of the many thousands Chinese web stores. Yes, there are truly thousands of online stores. The quality of these stores and their products have improved immensely over the last 10 years. A few hundreds are here to serve you the best they can. Their goal is to give you the best deal. But don’t go blinded. Many stores just pop up and go in a few months with one purpose, to steal your money or send you fake products. Avoid them. How to avoid the fake Chinese stores? To buy products from China can be very profitable, but there are also risks involved. 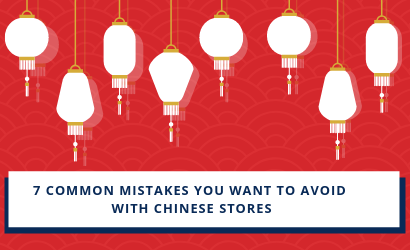 In this guest blog Bastiaan de Koning from StartBuyingInChina.com takes you through the 7 mistakes you better avoid, when you start buying in China. Maybe you think you already know these mistakes and they won’t happen to you. After 6 years of blogging Bastiaan noticed that still many people get trapped by one or more mistakes. Don’t be that person. Avoid the mistakes and enjoy this guest blog. Chinese stores offer low prices. That’s why I started to buy products directly from China 10 years ago. Chinese stores can do this because many products you buy in your country are manufactured in China. By selling directly to you, you skip all the brokering from other companies who want to make a profit. The downside is that some people can take advantage of your ignorance. Scammy people create wonderful looking stores with fake, badly made or even no real products at all. People are blinded by the prices. ‘This is really a great deal!’ Blinded because they can buy a Macbook pro for 450 bucks, a Gucci bag for 50. Or wait, a taylor made wedding dress with lace and silk for just 100 dollar. What they don’t know is that some products cannot be bought cheaply in China. You cannot buy Apple products in China cheaper than you can in the USA. When I made this screen cap a few years ago, this Apple 15.4 inch cost 2.420 Euro or 3.200 USD. Here is its for just 484 USD. When you think you found the best deal ever, it’s probably the worst, because you will be scammed. Use the rule of thumbs first: If it is too good to be true, it isn’t true! And always check out the store. Is it legit or fake? What do other people say about this store? And of course check Scamadviser. China is well know for counterfeit products. A product is called counterfeit when it looks like a real brand, but is actually fake: sometimes a 100% copy with inferior material, sometimes with small adjustments to the original design, logo or brand name. Beware. Counterfeit and importing counterfeit is illegal in most countries. If you import a counterfeit Gucci bag in China, you might be punishable in your country. That’s never worth the risk, in my opinion. Another problem is the material. Like jewelry sold as sterling silver can be made of fake material. Check out these Gucci bags. Fake products can be recognized by badly made details like a poor imprint of the name and logo. Everything starts with common sense. It’s impossible to find a real expensive brand or product for a bargain price in China. If you see one, your alarm bell must go off. Don’t get fooled by the prices. In mistake number 2 we looked at counterfeit. Although this is illegal in most countries, there are more products illegal to import. Most countries have rules for animal products, organic products, weapons, toys that look like weapons, products that can be used like weapons, medicines, radio transmitters. When you import these kinds of products, you might get in trouble with your customs. Check your countries import rules, if you are not sure. For example the green lasers. Some lasers have a range up to 6000ft or 2km. In the USA laser pointers are forbidden above 5mW. In Australia these are forbidden above 1mW. In some Chinese stores you can find laser pointers from 50mW! That’s strong enough to blind a pilot in an airplane and forbidden in most countries. Your country has specific rules about the products you can import or not. Although you can buy these products legally in China, to import them to your country might be not. Check your custom regulations to find out whether you can import the products or not. Chinese stores are well known for their free shipping. But… It an take a long time before your products are delivered. That’s why al Chinese stores offer some kind of express shipping. The express shipping methods promise faster delivery and more tracking possibilities. The express methods are always more expensive. If you need a product fast, contact the store. Check if they have your product in stock. Check for oversea warehouses. If not, just be patient and select free shipping. The number of payment methods a store offers is an indication for their trustworthiness. If they only offer Western Union or bank deposit, you can easily get scammed. That’s because you can’t follow the money after it is delivered. Credit card & PayPal offer money back insurances. Most scammers do not use these systems. But even if they mention multiple payment methods on their site, it is not guaranteed you are dealing with a real store. I’ve heard many stories that people are asked to use a more dangerous payment method, because their ‘PayPal’ wasn’t working at the moment. Hmmmm, my alarm bells are ringing! Look at this check out page. To pay, you must send money to a person called YanJie Han with Western Union. After your payment they will ship in 2 days. But did you know, that once the money is accepted by the seller, there is no way to get a refund if they do not deliver? A small number of payment methods is an indication for fraud stores. If possible, always choose the most secure payment option. When money transfer is the only option in your country, be sure your dealing with a real an trustworthy store. Real stores like AliExpress have a 100% satisfaction guarantee. The money is stalled as long that the products are not delivered. If your products are not delivered or you are not satisfied, you can always get a refund. Check your store if they have any guarantee like that. My friend Saskia is a yoga teacher and she sells yoga mats to her students. She needs 10 mats. If she would buy this in the Netherlands, she would pay for a good quality about 30 euro (33 US$) each with shipping costs too. When buying online in China, it would only cost 20 euro (22 US$) each. Free Shipping. Sounds great, right? She can save up to 100 euro (110 US$)!! But what happened? When the parcel was delivered at her door, she had to pay another 67 euro (74 US$) to the postman. If she didn’t pay, she didn’t get the parcel and would lose everything. She had no choice at that moment, but to pay. Why this extra costs??? Her savings vaporized to only 33 euro. These unexpected costs gave her a bad day. You can imagine. The shopping site didn’t tell her this could happen. And who is to blame? The Chinese shop? No, it all has to do with the (in this case European) import regulations. What can you do to avoid these extra costs. - When do you pay declaration costs? Netherlands above a product price of 150 euro. - When do you pay VAT? Netherlands above a product price of 22 euro. Try to stay below these numbers. If you have free shipping, split your order in multiple smaller orders and stay below the free limits you can import. It might be a lot of extra work, but can save you a lot of money too. And check if the stores have insurance for these costs. In the situation you must pay extra costs, some stores offer a refund for these costs. Products are delivered from the other site of the world. This takes time. A few years ago it could take up to 30-60 days. Nowadays the bigger stores have oversea warehouse and can promise delivery times within 7 days. But still, not all the stores are that big. When you buy at AliExpress, you are not dealing with one big store at all. AliExpress is a market of thousands of smaller independent retailers and manufactories. When you buy products from China, after you did your research, checked for real stores, used a safe payment options. You still need to wait. Know that 7 days is very fast to get some product from all over the world to your doorstep. Don’t be impatient when it takes a little longer. Just chat with the store and ask if they can help. Some parcels do get lost. Your seller is often willing to send you a new product if this happens. Sandra: Well, I have had registered orders from China that took more than 2 months to arrive, just to leave China took more than a month. Why? Because many times they’re in transit in China, they go from one city to another until they’re put on a flight to Portugal! John: My wife ordered a hat for a wedding 22 days in the future. Selected postal expedited (5-8 days). It arrived (damaged) a week after the wedding. When you need your products fast because you really must have them fast, don’t buy it in China. For example, if you have an event like a wedding and you plan to buy some products from China, make sure you have at least two months ahead. If time is not a real issue, enjoy the benefits when you start buying in China!